Small and perfectly formed springs to mind about the wedding cake we delivered to Sandbank Restaurant, Leigh on Sea on Saturday 8th August to help celebrate the wedding of Loraine and Robin. 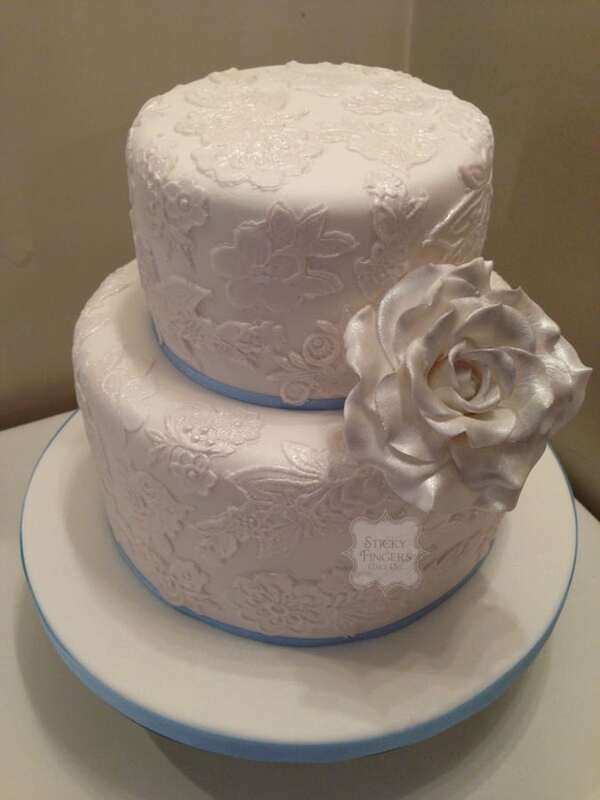 Although they were only having a small, intimate wedding with their closest family and friends, they still wanted a “proper” wedding cake so decided on a small 2 tier cake, covered in sugar lace, with a big, showy rose to finish off. The flavours they chose were Lovely Lemony Lemon Cake for the bottom tier and Madagascan Vanilla for the top tier – really great flavours for a scorching hot day! Congratulations Loraine and Robin – I hope you had an amazing day!